The U.S.S. Enterprise-D travels the Lorenze Cluster in search of a missing Federation starship, the U.S.S. Drake. The ship was last reported near Minos, a heavily-populated planet of arms merchants that gained notoriety for arms deals during the Ersalrope Wars. 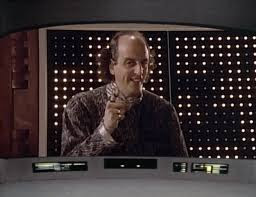 Upon reaching orbit, the Enterprise is greeted by an automated salesman (Vincent Schiavelli), who espouses strength through superior firepower. An away team by Commander Riker (Jonathan Frakes) explores the now-uninhabited Minos. A weapon that imitates Captain Rice of the (destroyed) Drake attempts to gather tactical information from Riker, and when he proves uncooperative, encases him in a force field. Captain Picard (Patrick Stewart) beams down with Dr. Crusher (Gates McFadden) to help Data (Brent Spiner) and Yar (Denise Crosby) with Riker, leaving Geordi (Levar Burton) in command of the Enterprise. On the surface, the away team is hunted by automated drones, and Picard and Crusher are separated from the others. They fall into an underground control center, and it is here that Picard realizes the Minos’ own technology destroyed the planet’s population. Their weapons grew too smart; too powerful. While Geordi grapples with a Minosian weapon in space, Riker and Yar must contend with constantly adapting drones determined to kill them. Dr. Crusher, meanwhile, is badly wounded, and Picard must find a way to save her life, and the lives of those on the surface. 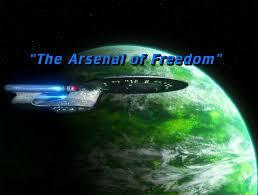 “The Arsenal of Freedom” is one of my favorite episodes of Star Trek: The Next Generation’s (1987-1994) first season. The episode provides a healthy social commentary about a real-life “diplomatic” or ideological belief system of the eighties (Peace through Strength) and features more action than most episodes of the series, combined, at least up to this point. “The Arsenal of Freedom” positions Minos as a space-age version of America, exporting weapons (planes, guns, tanks) to other countries both legally and illegally (Iran-Contra), and using the “Peace through Strength” as a kind of ideological cover for something less noble than the pursuit of peace: economic war-profiteering. Part of the reason that “The Arsenal of Freedom” holds up well is that “Peace through Strength” as a concept (and belief system) is back in force today, and has been applied not just to international relations, but domestic gun policy to boot. The answer to gun violence, according to this belief, is always more guns (and therefore more gun sales). It’s a corrupt nexus of politics and economics, for certain. Many of those politicians who constantly espouse more guns are supported by those who manufacture and sell guns. Like Cheron in the original series’ “Let that be Your Last Battlefield,” Minos in “The Arsenal of Freedom” represents a warning to 20th century (and now, 21st century) audiences. If we don’t overcome our petty differences (and here, our obsession with weapons of mass destruction), then the end of the world may be nigh. In addition to its eighties-flavored yet still relevant social commentary, “The Arsenal of Freedom” is jam-packed with great action. 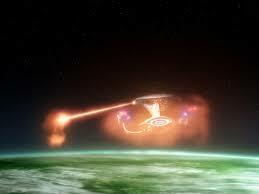 On the wild planet surface, alien drones hunt an away team, and in space, the Enterprise combats another weapon, even separating the saucer section for the orbital battle. It’s intriguing to note that the idea of a constantly adapting enemy would be one later developed on the series with the Borg. Here, the Minos weapons are self-replicating, self-improving too. And although it would be a violation of Starfleet principles, it would be interesting to see the Borg go up against these drones (or possibly, assimilate them). 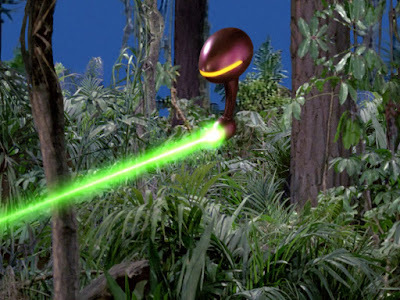 Starfleet’s best defense, ironically, could be the Echo Papa Drones seen in this story. One other aspect of this episode that has always intrigued me is the “point and drag” nature of the hand-phasers used by Data, Yar and Riker. They fire phasers -- holding down the trigger button -- and then move the amplified coherent beams to their targets rather than aiming and trying to score a direct hit. How can anyone ever miss with a weapon like this one? Just emit a beam, and rake or drag it to your target! This seems like a real advance in phaser power and function, but is not addressed in this, or later episodes. Finally, as a Space: 1999 (1975-1977) fan, I should address the minor controversy involving this episode, once brought up in the reader pages of Starlog Magazine in the eighties. 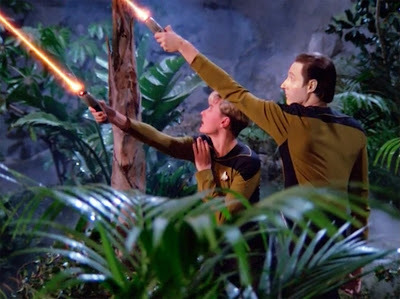 Specifically, one Year Two episode of that Gerry and Sylvia Anderson series featured a scene in which the commanding officer, Koenig and chief medical officer, Russell were trapped in a cave. The medical officer was sick, and used fungus found growing on the cave wall to hand-craft a cure for herself. The episode was titled “Journey to Where.” In “The Arsenal of Freedom,” there is a similar scene in which a commanding officer (Picard) and chief medical officer (Crusher) are trapped in a cave, and the doctor uses elements found in the cave to craft a healing compound for wounds. In both cases, these two officers are trapped together, share an attraction, and character information about the doctor is revealed. In terms of series continuity, we meet a thoroughly unpleasant chief engineer here, Mr. Logan, and, for the first time since “Encounter at Farpoint,” see the Enterprise saucer separate from the battle section. In more human terms, Geordi’s anxieties about command are well-played by Levar Burton, and Counselor Troi (Marina Sirtis) seems more hard-edged than usual, which is a positive development. She actually proves helpful in the crisis; counseling the rookie captain about how to address his inexperienced officers on the bridge during a crisis. This seems to me how Troi should have been used more frequently in the series. I have probably, over the decades, watched “The Arsenal of Freedom” a dozen times. This is because its action and social commentary seem, at least to me, a satisfying updating of the best qualities of the original sixties series As I’ve written before, too often in the early days of Star Trek: The Next Generation a real sense of danger is missing. Not so here. This episode, though not remembered as a great one by most fans, blends all the Trekkian elements together in a pleasing, exciting, and entertaining packaged. "The Arsenal of Freedom" isn't high on my list of episodes that stood out for me, but your analysis stirred my memory and I do have mostly positive feelings about it. Particularly Riker's conversation with Rice, and the good ship Lollipop. Logan, it seems, was only around to serve as a foil to LaForge, and we never see him again after this episode. But Geordi has the last word in their brief, contentious relationship. How do you get back at that jerk engineer guy? Why, take his job, of course! 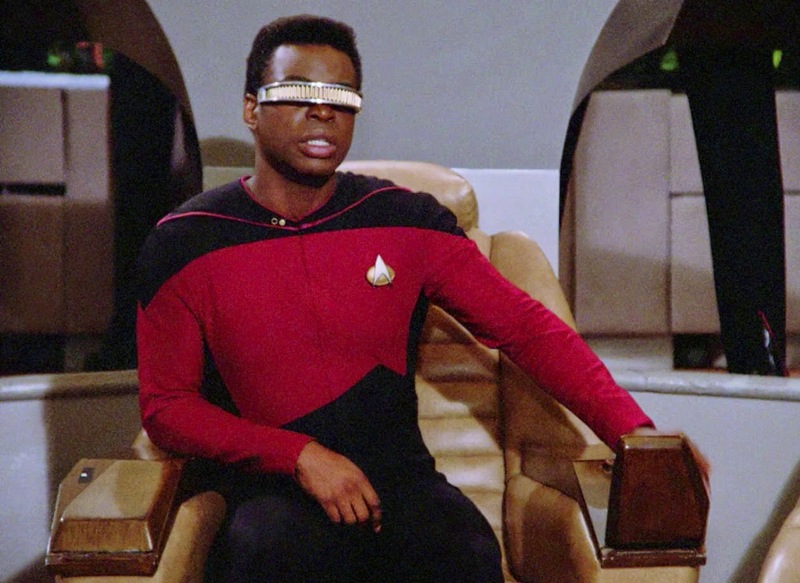 Who knew at this time that LaForge would be chief engineer one day? A much better fit than Logan, that's for sure. While tonally different from the show that The Next Generation would become, this is certainly one of the strongest 1st season episodes. I haven't watched it for years but your recap reawakened a lot of strong and positive memories or this episode. The characters all still seem a bit stiff but its clear that the writing staff was beginning to understand who they were, what their idiosyncrasies were and play to those characteristics. Honestly, it's a bit too on the nose for me from a social commentary stand-point but it certainly was fun and gave the viewer a lot to think about.